“If you ride like lightning, you’re going to crash like thunder”, a friend tells Luke. The Place Beyond the Pines opens with an impressive sequence of a local fair where we are introduced to Luke Glanton (Ryan Gosling), a stunt motorcycle driver. We see his tattooed body first – with a ship on his back, his cigarette and his partner – a motorcycle. After performing his act in a “globe of death” for the residents of Schenectady, Glanton comes face to face with Romina (Eva Mendes), a local girl with whom he had a one-night-stand a year ago. He soon discovers he has a son with Romina and decides to take responsibility for both the child and the mother. Glanton’s life of reckless abandon changes forever when he sees Romina with another man, Kofi (Mahershala Ali) at his child’s christening. It is a heart-breaking scene where nothing is said but a lot expressed… that’s the brilliance of director, Derek Cianfrance who has made a crime drama that is emotionally taxing and refuses to give an easy way out, both to his characters and the audience. Glanton starts using his best “skill” to rob banks and riding away to safety on his trusted bike. We are treated to some stunning escape and chase sequences before we meet Avery Cross (Bradley Cooper), a rookie cop who turns into a local hero. He is uncomfortable with the new developments in his life and the corruption at the Schenectady Police Department. The director makes us empathize with Cross and when we think the story is going in a certain direction, it takes a sharp turn again. The final act, though dramatic and grand, leaves a lot to be desired… but then you can have your own interpretations. 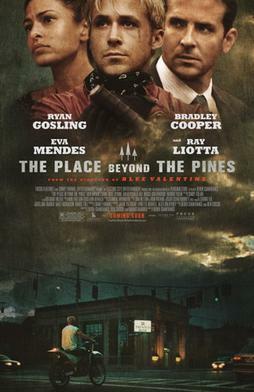 Written by Cianfrance, Ben Coccio and Darius Marder, The Place Beyond the Pines is not an easy film to watch and that’s where lies its brilliance. It is an ambitious film that explores the themes of father-son relationship, crime, remorse and redemption. Gosling delivers a brilliant performance as a brooding criminal who just wants to take care of his girl and his son. Cooper on the other hand has a more complex character and he does full justice to it. In one scene he finds himself holding a baby at a suspect’s house where they are conducting a raid; we can feel his guilt in this wonderfully written, directed and performed scene. Eva Mendes manages to make her presence felt even while the film essentially focuses on the two male characters. Her scenes, though short, show her as a confused girl to an angry lover and later, a desperate mother. Cinematography by Sean Bobbitt is another highlight of the film… grand shots of Glanton riding through the pines to the more intimate and disturbing scenes, everything is perfect. Music by Mike Patton is excellent, especially this hauntingly beautiful track “The Snow Angel” that you also get to hear in the film’s trailer. At 140-minutes, it is a long film but if you don’t mind movies that make you uncomfortable, then this is ticket you should buy this weekend.